Compuesto is a beautiful gray PRE gelding imported from Spain in 2015. He stands at 15.3 1/2 and is the ultimate AA dream horse! He is wonderfully light in the bridle, easy to sit, sensitive without being hot, forward thinking and SAFE. He was primarily trained and ridden by an adult amateur for the last 2 years. He does not require any maintenance, has no soundness issues, and is an easy keeper. â€‹Compuesto is schooling all of the 3rd level movements with flying changes started. 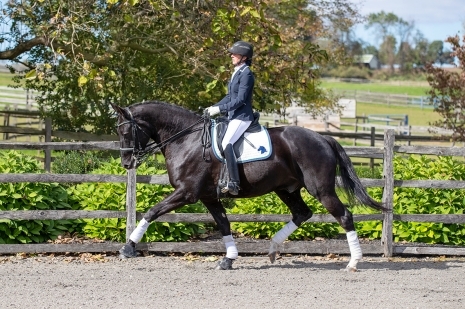 He shows great aptitude for piaffe and passage with an extended trot that will leave you smiling! He has presence on the ground and under saddle with a puppy dog personality to match. He also loves to explore the trails!